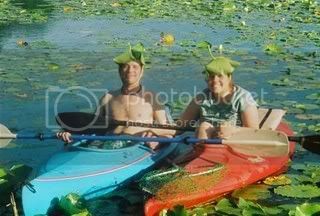 My husband and I have been kayaking for about fifteen years, long before it became a “cool” thing to do. It started as a family activity with our son, and now that we’re (sort of) “empty nesters”, it continues to be the miracle cure for all that ails us as a couple. You can see from the picture on the left that it seems to have the same effect on that couple! We began this season last Sunday on a pristine pond in York, Maine. We were both facing grueling work weeks, taxes, piles of Spring chores, calls to be returned, bills to be paid, dishes, laundry, and enough other stuff to make us bark at each other all morning. Then, after less than two minutes on the water, all was bliss. We were smiling, “cloud painting,” taking pictures of turtles, and joyfully paddling around the pond. No, I’m not a rep for a kayak company. I’m telling you this because kayaking is one kind of “high energy fun,” and fun is vital for couples to experience together for bonding. It’s also the kind of “in the moment” activity vital for all of us, coupled or not, to have in our “refueling” repertoires. So, if you’re near water, try it! If boating isn’t your thing, do something else which brings you pleasure, and takes you away from all the busy stressors in your life. Maybe I’m out of the loop, but what it “bebo”?